This year’s Grace Hopper Celebration 2017 (@ghc, #GHC17), the world's largest gathering of women technologists, took place in Orlando Florida at the Orange County Convention Center on October 4-6. The events occurred in two locations: the Orange County Convention Center West (OCCC) and the Hyatt Regency (Hyatt), which is directly connected by skybridge. GHC is presented by the Anita Borg Institute for Women and Technology, which was founded by Dr. Anita Borg and Dr. Telle Whitney in 1994. Grace Hopper attendees grew from 500 in 1994 to over 18,000 in 2017 with around 700 speakers. This was my first time attending the conference and I was fortunate to receive an AnitaB.org travel scholarship to attend GHC. The scholarships cover registration, travel, hotel, and meal expenses. Only 657 were selected from almost 15,000 applicants. In addition, three other graduate students from the Department of Computer Science at Old Dominion University attended the conference. Aida Ghazizadeh presented a poster, Maha Abdelaal got a Google scholarship, and Wessam Elhefnawy got a Hooper scholar. I was also lucky to have my sister Lamia Alkwai attending the conference who is a grad student at King Saud University, Riyadh, Saudi Arabia and also received an AnitaB.org travel scholarship. Previously, Yasmin AlNoamany, a PhD graduate from @ODUCS @WebSciDL, attended GHC in 2015, 2014, and 2013. Before attending the conference a phone application named GHC 17 was introduced that includes news feed, schedule, sponsors, top companies, resources and more. I really liked this application because it makes it easy to create your own selection of talks you want to attend, location, time and brief description of the talks. Also, another good resource is the GHC Scholars Facebook Group where questions are answered promptly and you can connect with other GHC attendees. The conference schedule had inspiring talks and events which included keynote speakers, presentations, panels, workshops, a career fair, and a poster session. This year there were 20 different tracks which are: career, community, CRA-W, student opportunity, ACM research competition, general poster session, general session, lunches and receptions, special sessions, IOT/Wearable tech, products A to Z, artificial intelligence, computer system engineering, data science, human computer interaction, interactive/privacy, software engineering, open source, and organization transformation. On Tuesday, there was the first first timers orientation, where five speakers gathered to talk about the keynotes, featured speakers, types of sessions, students and faculty highlights, networking opportunities, planning your GHC survival skills, and staying engaged with AnitaB.org. The presenters in this session were Kathryn Magno, the Sr. Program Manager of GHC Operations at AnitaB.org, Rhonda Leiva, the Senior Program Manager of Student Programs at AnitaB.org, Beth Roberts, the Manager at GHC Content Operations, Stuti Badoni, the Director at GHC Content, and Radha Jhatakia, the Program Manager at GHC Content. Some of the tips mentioned were to not miss out on the keynotes, connect with speakers and students, check out the poster session, and attend the career fair. Other notes included wearing comfortable shoes, drinking plenty of water, and pacing yourself. They mention the “I AM” Movement! which is a sign that you can write on to define who you are in your own words. They concluded the talk with answering some of the audience questions. Wednesday’s keynote started with Aicha Evans, the Chief Strategy Officer at Intel Corporation and a Board Member at AnitaB.org. She welcome everyone and mentioned that today’s women technologists are shaping the future of technology. She introduced Dr. Fei-Fei Li, a Professor and Director at Stanford University AI Lab and the Chief Scientist at Google Cloud AI/ML. Dr. Fei-Fei Li talked about her experience as an immigrant when she moved to the United States at age 16, where she had to learn the language and understand a new culture. She also discussed the research she has been doing on Artificial Intelligence. After that, Vicki Mealer-Burke introduced the winner of the Technical Leadership ABIE Award. This year’s winner was Diane Greene, the CEO of Google Cloud and a Board Member at Alphabet (ABIE Award Winner). People described her as a problem solver who understands technology and understands how to bring these technologies into the marketplace at a foundational level. She believes that one of the biggest contributions to her success was her father who gave her the confidence at an early age which structured her life journey. Her father would hand her the steering wheel and let her navigate the sailboat at age three. She also discussed the projects she worked on early in and her work and challenges when working on VMware. Next, Megan Smith, a Former U.S. Chief Technology Officer, started her talk by showing her “I am Movement” sign - "I am so ready to upgrade tech culture with all of you". She talked about diversity and how to find jobs for people. She talked about the challenges of tech diversity and that it is time to make real progress in this matter. She showed that in 2016 only 21.7% of women in the US were employed in the technical workforce and in 2017 it had risen to 22.95%. This rate is considered low and we must work hard to make leadership increase in priority. In that matter four companies that made more progress are celebrated at GHC. 1- The first company that made the most progress with senior executives and technical executives and others is IBM. 2- The second company that got an award was Accenture, which was in the technical force of over 10,000 category. 3- The third company was GEICO, which was in the technical force of 1,000-10,000 category. 4- The fourth company was ThoughtWorks, which was in the technical force of under 1,000 category. Next, Monique Chenier, the Director of Employment at Hackbright Academy, presented the ABIE award winner for social impact. This Social Impact ABIE Award Winner was presented to Dr. Sue Black OBE. Dr. Sue Black talked about the struggles she faced early in her life that led her to found #TechMums, which empowers mothers and their families through technology. TechMums is currently working with 500 mothers in the UK to give them skills, knowledge, and confidence to build successful lives. Dr. Black said, “If you help a million mothers, you are helping at least two million people because every single mother is a caretaker for at least one other person.” Dr. Black is also the founder of BCSWomen, the UK’s first online network for women in tech. Next, Melinda Gates, the Co-Chair of Bill & Melinda Gates Foundation, talked about her early relationship with computers in her high school years. Afterwards, she talked about her projects in Microsoft and the big risks that you must take to move forward. Then, she spoke about the importance of diverse teams. She pointed out that in 2015 there were only 25% of women in the tech force and they held only 15% of technical roles. She also mentioned that tech is being part of our lives and it is going to grow and that AI should be taught the best of what humanity has to offer and that building AI should be for all genders and all ethnicities. She discussed the importance of making many pathways for people who have interest and talent in tech. The next ABIE award was presented by Cindy Finkelman, the CIO FactSet Research Systems. The winner of the Students of Vision ABIE Award was Mehul Raje, a Master of Engineering degree program student at Harvard University. She talked about the steps she is taking to increase the number of women in computing. Dr. Vicki Hanson, the President of the Association for Computing Machinery (ACM), presented Dr. Telle Whitney who co-founded GHC along with Dr. Anita Borg and served as president for AnitaB.org for 15 years. She talked about the work that GHC does to create cultures where women thrive. She talked about the goals that she wishes that would be accomplished. Dr. Fran Berman, the Hamilton Distinguished Professor of Computer Science at the Rensselaer Polytechnic Institute and the Chair of AnitaB.org Board of Trustees, presented Dr. Brenda Darden Wilkerson the President and the CEO of AnitaB.org. Dr. Wilkerson was excited to continue the journey that Dr. Telle and Dr. Anita started. In the Artificial Intelligence track I attended the presentation: AI for Social Goods. In this session there were two talks. The first was the presentation on Can Machine Learning, IoT, Drones, and Networking Solve World Hunger? Presented by Jennifer Marsman, a Principal Software Development Engineer at Microsoft. The presenter talked about fighting world hunger using machine learning, drones, IoT, and networking research for precision agriculture. Recent studies show that food production must double by 2050 to meet demand from the world's growing population. 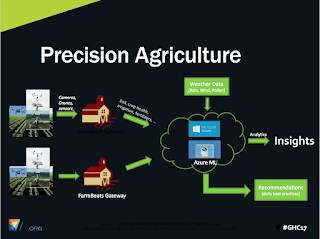 In this work they use the idea of precision agriculture which is a farming management concept based on observing, measuring, and responding to inter and intra-field variability in crops. They try to use drones to help accomplish that with the use of placing sensors to measure the amount of water. The had several challenges such as sensor maintenance, power consumption, and where to place them. This approach was tested in 100 acres of farm in Carnation, Washington State and in a 2000 acres in upstate New York. The demo of this work can be found at Microsoft Cognitive Services. The second presentation was Bias In Artificial Intelligence, Presented by Neelima Kumar, a Software Manager at Oracle. In this talk the presenter talked about the shortcomings of Artificial Intelligence (AI). She showed real life examples of IA that are racist or sexist. She first asked what we pictured in our mind if when the word nurse is used, is it a female nurse or a male nurse? Another example was the Google photo app that categorized a picture of a 22 year old and his friend that was categorized as gorillas. 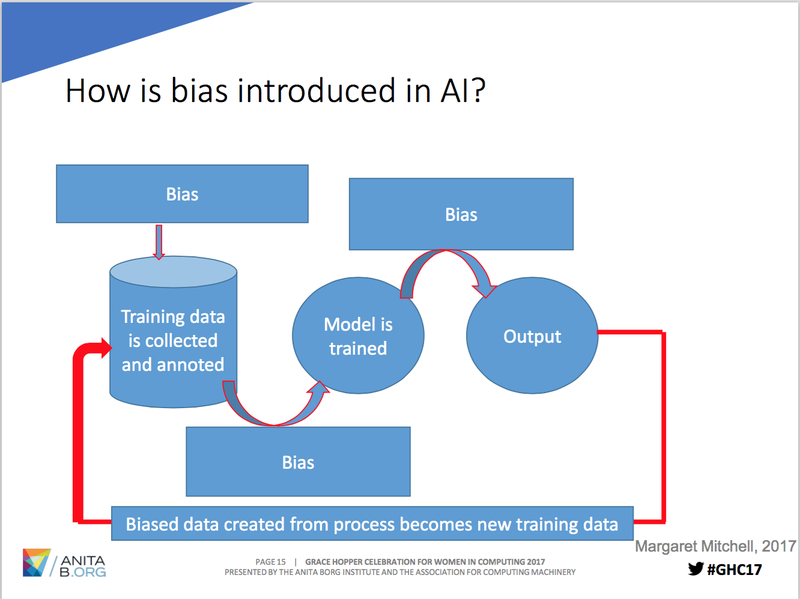 She discussed where Bias is introduced in AI. In AI the steps usually include training data that is collected and annotated, then the model is trained, and finally we get the output. The bias can be shown in every step. To solve the bias we need to build awareness of possible biases, digest for inclusion and diversity, and work with communities affected most. Finally the presentation was concluded by the phrase “AI will change the world but who will change AI”. Career Fair was huge, it had most major of the companies such as Google, Microsoft, IBM, Facebook, Snapchat, and a lot more. Each company discussed the different opportunities they have for women. I would recommend having your CV printed out if you are looking for an internship or a job, as there are also on-the-spot interviews. They also had two poster sessions, the ACM student research competition where Aida Ghazizadeh presented her poster, and the GHC general poster session. It was interesting to see all the different research people were doing. There was a poster session competition and the winners were announced at Friday's Keynote. Thursday keynote started by Ana Pinczuk, the Senior Vice President Hewlett Packard Enterprise and a Board Member at AnitaB.org, presenting three more ABIE award winners. She introduced Mary Spio, the Founder and CEO of CEEK VR, Mary started by showing her "I AM" Movement sign where she wrote "I am changing the face of innovation and I need your help". She mentioned her struggles during her beginnings. When she came to the US at age 16, she worked at McDonald's and when she got her first paycheck she thought it was more than she could have and asked her boss if it was a mistake, her boss thought she was complaining and he instantly offered a higher paying job. This was her first lesson to not be afraid to ask for more. After that, she joined the army, then got a scholarship to go to college. Next, her career bloomed and got some patents for technologies she developed. Later on she did some tours on behalf of the US to spread the goodwill of America. She then worked on CEEK VR the virtual reality eyewear experience. She concluded by discussing the importance of diversity and that it is a necessity for innovation. To present the next ABIE award winner was presented by Astrid Atkinson, the Engineering Director at Google Product Infrastructure. She present the winner of Change Agent ABIE Award Winner Marie Claire Murekatete, a Software Manager at Rwanda Information Society Authority (RISA) and the Founder of Refugee Girls Need You. She discussed the challenge she faced such as not owning a computer at college level. "Not giving up and having endless curiosity, my wish is for all of you is to enjoy life the fullest and overcome any challenges that come your way, find a tribe of wonderful people who can help you say yes to big opportunity" says Marie Claire Murekatete on what she learned from her experience in life. Cathy Scerbo, the VP of IT Business operation at the Liberty Mutual Insurance, recognized the next ABIE award winner. The next ABIE Leadership Award Winner, was awarded to Mercedes Soria, Vice President of Software Engineering at Knightscope, Inc. She discussed the challenges she faced coming from the Ekwador and not knowing how to speak English, but she overcame the challenges and always focused on her studies. She concluded her talk by showing her "I AM" Movement sign "I am a crime fighter and I develop technology that saves peoples lives". Next, Debbie Sterling, the Founder and CEO of GoldieBlox. Debbie started by showing her "I AM" Movement which says, "I am a pick aisle disruptor". She talked about her journey in finding her passion. She studied mechanical engineering and product design at Stanford University. She had an idea with her friend to have building construction toys for girls. Bit by bit she started to come up with toys that girls will enjoy and let their imagination set off. She ended up creating the company GoldieBlox, which is based on a girl engineer who solves problems. The company was founded in 2012, and it was recognized as a leader in children’s entertainment and has reached billions of consumers. After that, Kim Garner, the Vice President Advisory Services at Neustar, Inc, introduced the winner of the Technology Entrepreneurship ABIE Award Winner. The award was presented to Dr. Laura Mather, the CEO and Founder of Talent Sonar. Dr. Mather startup was with cybersecurity space such as Bank of America, Apple, etc. After that, she tried to use technology to address unconscious bias. She explained that the main solution to solve this bias is through changing the process of doing things such as hiring, mission making, and permissions. In special session track I attended the presentation for the featured speaker Yasmin Mustafa, the Founder at ROAR, Coded by Kids, Temple University. She is a refugee of the Persian Gulf War. She talked about her journey in coming to the US and her struggles in life. After that, she became an American citizen, and then she started running a blog, built her audience, and fell in love with marketing. She then started the Philadelphia chapter of Girl Develop It, an organization that aims to get more women to learn programming in supportive environments. This enabled her to travel around South America for six months, there she encountered many women who had been attacked or harassed. This inspired her to create a self-defense wearable technology company aimed at diminishing attacks against women and addressing the underlying causes of violence. She created a company to create the wearable devices called ROAR for Good, and she became CEO and the Founder. The take-away of her talk was, “You have to be a little naïve and crazy to start a company, don’t listen to naysayers, and you can start a tech company as a non-techie”. You can find Yasmin TEDx Talk “The Birth Lottery Does Not Define You”. "You have to be a little naive and crazy to start a company"
The next session I attended was in the AI track. The presentation's title was “Recommendation Systems”. The first talk was “Buy It Again: Repeat Purchase Recommendations for Consumables”, presented by Aditi Bhattacharyya, Technical Lead in the Amazon Personalization organization. She started her talk by asking the audience if they ever have used Amazon, and almost all of the audience had. She discussed that Amazon uses personalized recommendation for each customer. She gave an overview of types of recommendations that existed. The first was collaborative filtering by collecting information from other users who had previously bought some similar items and item-to-item collaborative filtering by recommending items that are in the same category of the customer’s purchasing history. They recommend consumables such as buying the same grocery items, house supplies, office supplies, and health care items, so the model has to predict when the user will need to buy it again. Next, she discussed the method to build the model which depends on the repeat purchase count; however, the challenge was if an item was irrelevant to the customer anymore such as buying a baby formula. Time decay model assigns weights to the purchases based on time where the weight will decay over time, this also could be a challenge because after a certain amount of time the items weight could be so low although it is relevant. These challenges lead to creating a consumption rate which is the rate of the repeat purchase and the timestamp of last and first purchase. 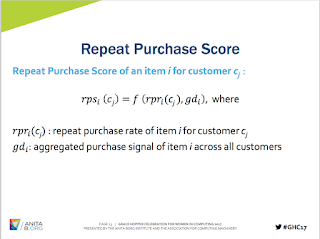 To know the repeat purchase score of an item even if the user purchased an item for the first time but based on the item’s score from other customers, then the repeat purchase score of the item is based on the repeat purchase rate and the aggregated purchase signal of item across all customers. This means that both the repeat signal of the customer alone and all customers is considered in the recommendation. 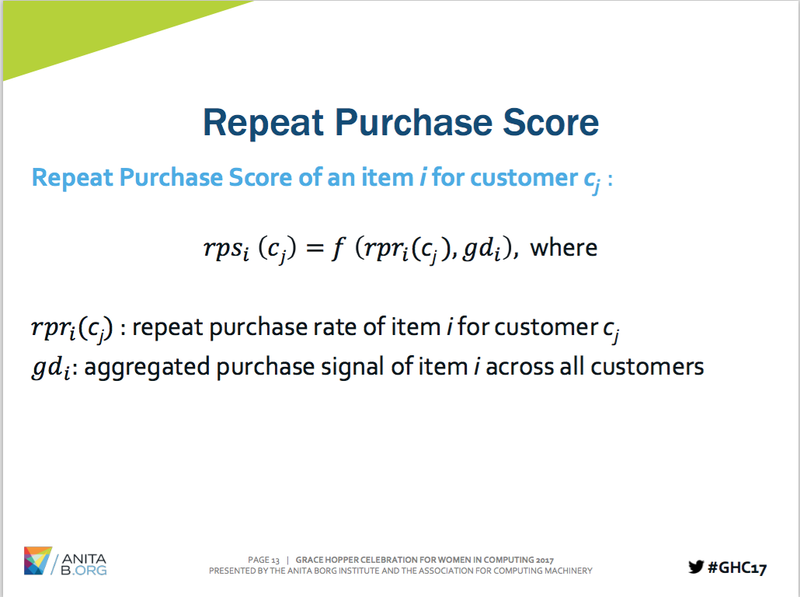 The threshold of creating a recommendation is based on the repeat customer count, total customer count, repeat customer probability, repeat purchasable if both repeat customer count and the repeat customer probability are higher than a certain threshold which is calculated during offline and online process, and finally rank descending order of repeat purchase score. To optimize the process to perform the calculations on all the items they divided the task to online and offline process. Offline process includes expensive computations, build process, and offline filtering. Online process includes real time service lookup, online filtering, and front-end rendering. Next, in the evaluation both offline and online metrics. Precision and recall are used for offline metrics and A/B testing framework by showing the current recommendations and the newly introduced recommendations and other metrics such as purchases, views, click rates, and engagement. They found that this method of recommendations has improved the purchase rate. The second talk was “Learning to be Relevant, Course Recommender Systems for Online Education”, presented by Shivani Rao, LinkedIn. The goal of the talk is to learn about the algorithms behind course recommendations for the online education platform. In general, because skills are always coming and going and because the job market is dynamic, learning does not stop after school and there is a need of lifelong learning. To create member-to-course recommendations there is both offline and online processing. The Offline processes both the member data and the course data to member-to-course recommendation which is stored in a Key-Value-Voldemort for high-scalability storage. After that the online process starts with using the Restli Service to Front-End. Usually the offline process is used for email flows, and the online can be used for viewing online feeds and other online activities. For solving the cold start problem they used the information provided by the user in their LinkedIn profile. However, since only 30% of users fill in the profile, there is an option to use members’ inferred title and most distinct skills associated with it based on members’ cohort. Another challenge was that only 2% of the skills are covered by manual tagging. The solution was to learn a supervised model using the manual tags as labels. Selecting courses for members is done by scoring and then ranking the courses. An additional challenge that the system can have is scaling challenge because each model has recommendations for 500M+ members and 200+ courses. A solution is that a model is not served to all the members and that same model may be served in different channels with different treatments. The last topic discussed was Micro-content, and the challenges it has such as how to identify the videos that are useful, which is solved using key features. More information on this topic can be found here. The final talk in this session was “Related Pins at Pinterest: Evolution of a Real-World Recommender System”, presented by Jenny Liu, Software Engineer at Pinterest. The talked started by an overview of Pinterest. Then she noted that in Pinterest 40% of the views and saves come from related pins recommendations. The main principles for building systems are start simple, keep it simple, and optimize for iterations. The major pieces of related pins were candidate generation, memorization, and learning to rank. Candidate generation could be from user boards and board co-occurrence. Since calculating the co-occurrence of every pin is computationally expensive, they started off with random sampling and using heuristics score which worked really well. For finding candidate recommendations for pins that are only connected to one board they find pins that could be more than one hop away. They use the Pixie system to place all the coins in the memory and perform random walk with over 100,000 steps. However, in this system new pins are not visited during random walks. To solve this problem, they added fresh candidates which are the recent added pins. The next major pieces of related pins was memorization. When checking what are people clicking, we need to know the reason of clicking - is it because of relevance or because of the position? To solve this they added normalize by position, where they move pins that are worth more to a non-clicked position. The final major pieces of related pins was learning to rank. Here in the feature extraction of the candidates, the feature vector is converted to numerical value and placed in a score model which returns a score by multiplying that to the feature weights. This method increased saving pins. However, this had some challenges such as that the linear model is not enough, there were feedback loops, and it was hard to experiment with models. Linear model was caused by having the feature weight the same for multiple candidates. This is solved by creating a gradient-boosted decision tree. The second challenge was having feedback loops which is having the same candidates showing over and over again. This is solved by having 1% of the traffic for low score candidates. The final challenge was hard to experiment with models offline because of the huge amount of data, the time it consumed, and personalization is not possible because it was offline results. The result was investing more on making it an online serving. I attended the presentation Real World Application of IA. The first presentation in this session was Bring Intelligence to Resource Utilization presented by Xiaoqian Liu, Data Engineer, Salesforce. Salesforce Einstein is a lawyer within the Salesforce platform that infuses artificial intelligence features and capabilities across all Salesforce clouds, it builds a specific model for each customer per app. Successful resource assignments will improve job efficiencies and costs. 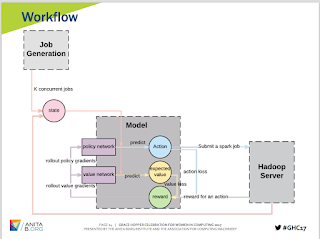 A case study is performed by applying RL on Spark job parameter tuning in real-time. 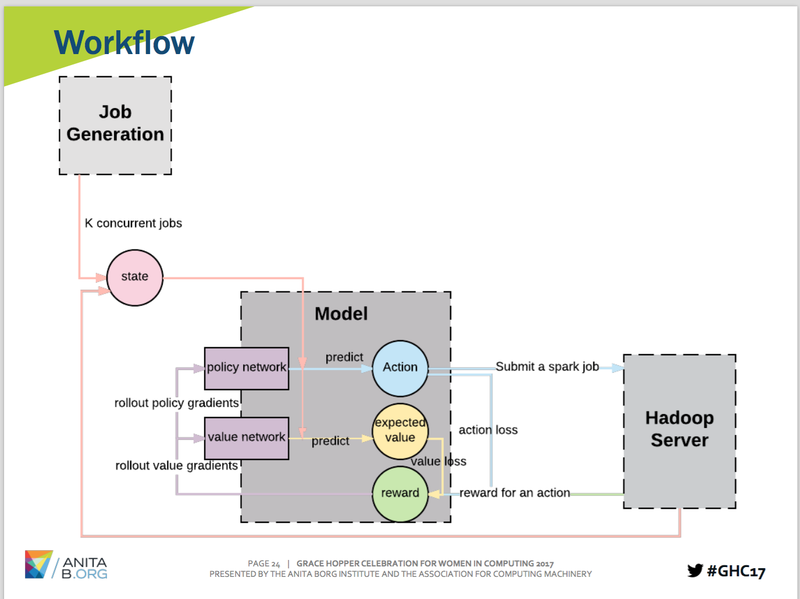 The workflow includes job generation, model, and Hadoop server. The next step was the system implementation, then experiment phase. The results of this project shows a slight downtrend in the output graph results which indicates that feature improvements are needed. The next presentation was Recommending Dream Jobs in a Biased Real World presented by Nadia Fawaz, Staff Software Engineer, LinkedIn. Recommendation systems trained on biased data may reflect the bias, this bias is crucial when it affects job finding. The technical scope challenges are in training, evaluating and deploying a large scale recommendation system based on biased real world data. This talk presented an overview of Jobs You May Be Interested In (JYMBII), which is a personalized list of jobs for the user. This list is generated by a machine learning model that has to be trained to predict a relevant score to measure how each job is relevant for a specific member on LinkedIn. The model is taught by feeding it data such as member information, job posting, and previous interactions between members and jobs such as clicks, saves, and dismisses. This process is performed both online and offline. Next, to answer where bias comes from. The bias actually comes from different stages, in the data such as gender gap in positions in hiring more women than men in educational roles and less in tech roles. There is bias in how data is collected such as pages that have low rank where the data is never collected from them, or the position bias if the user only clicked on the top jobs instead of looking at all the options. Another bias is model bias, where the model is too simple and has few parameters or insufficient features to fully represent the outcome. Reducing bias matters because people think it is unacceptable or are illegal. In business, members care about quality of recommendations, and removing the bias could cause a lift in the business. Finally, if bias is in the technical model, it can impact the performance metrics in both online and offline evaluations. Reducing the online bias in data can be done using two methods: fully random bucket for models that may not have been chosen and session-based top k randomization after ranking them which randomize the position of the first k set. This can be done using explore/exploit parsimonious randomization. Reducing the online bias in the training dataset by augmenting the dataset by adding random negatives, inferred positives, and high quality manual tagging. This could be evaluated by replay method by taking random bucket dataset as input, reranks based algorithm to evaluate, and compute top k reward on matched input. 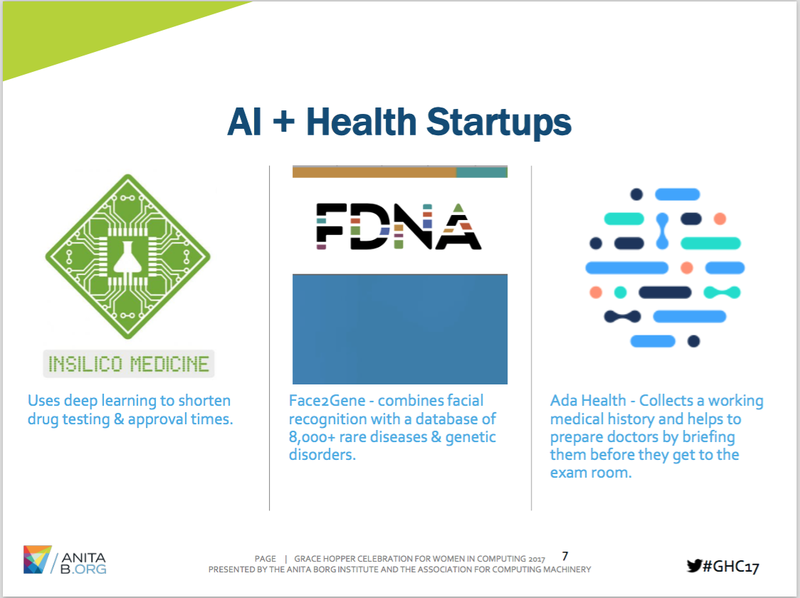 The final presentation in this session was Where DNA Meets AI - and How You Can Help! presented by Amanda Fernandez, an Assistant Professor in Practice, University of Texas San Antonio. This talk was an overview of general information on connecting DNA with machine learning and AI solutions. How to get started in this field is to first learn programming language, and familiarize yourself with research problems. Two recommended resources if you are bridging CS and biology: Deep Learning for Health Informatics, Ravi et al, 2016 and Deep Learning for Computational Biology, Angermueller et al, 2016. 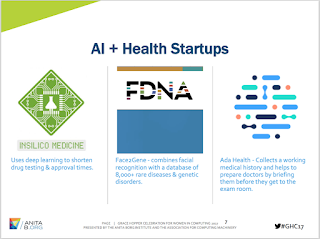 Some open source models that are helpful and recommended to use are Google’s PAIR Initiative, Kaggle, and the Big Data Genomics. I then attended the Social Celebrating Arab Women In Technical Roles, sponsored by Visa. I met many Arab and non-Arab women in computing (ArabWIC) who came from all over the world. The talk was presented by Dr. Sana Odeh, a Clinical Professor at the Computer Science Department, New York University, and Dr. Kaoutar El Maghraoui a Research Scientist at IBM. They talked about the goal of the group and what our job is towards it. After that, we socialized with others and we exchanged our bios and discussed the different ways to contribute to this group. Friday’s keynote was presented by Nora M. Denze the Board of Trustees of AnitaB.org. She presented Dr. Ayanna Howard, Professor and Linda J. and Mark C. Smith Endowed Chair in Bioengineering in the School of Electrical and Computer Engineering at the Georgia Institute of Technology. Dr. Howard gave on overview in robotics. Her recent research is in the area of pediatric therapy by using robots in the home for kids with special needs, which is important for people who could not afford regular therapy sessions. The lesson learned from this work is that humans trust robots and our intelligent machines are inheriting our human biases. Next, Dr. Brenda Darden Wilkerson, the President and the CEO of AnitaB.org, presented the winner of 2017 Lifetime Achievement Award Winner, for recognition of her dedication to women in tech, Dr. Telle Whitney AnitaB.org. To help honor Dr. Telle, Dr. Fran Berman, the Hamilton Distinguished Professor of Computer Science at the Rensselaer Polytechnic Institute and the Chair of AnitaB.org Board of Trustees, talked about all the amazing things that Dr. Telle did in the 15 years she served AnitaB.org. Dr. Fran then presented the award to Dr. Telle. Which talked about how important it is for us to make a change and contribute to the movement of creating more opportunity for women. Next, Dr. Jodi Tims, Chair ACM and Council on Women in Computing, presented the ACM Student Research Competition. GHC hosts one of the largest technical poster sessions in the U.S. This year was 90 posters total. The poster winners were announced. 1- Stephanie Mason, Western Washington University, US, the poster on "Characterizing Rigidity Properties of Protein Cavities through Data Visualization". 2- Theodore Weber, Western Washington University, US, the poster on "MyQuitPal-A Participant-Centric Smoking Cessation System". 3- Zalika Dixon, Capitol College, US, the poster on "Climate Control: Measurement of Ultraviolet Radiation". 1- Parishad Karimi, WINLAB, Rutgers University, The State of New Jersey University, the poster on "SMART: A Distributed Architecture for Dynamic Spectrum Management". 2- Aastha Nigam, University of Notre Dame, US, the poster on "Harvesting Social Signals to Inform Peace Processes Implementation and Monitoring". 3- Mariam Nouh, University of Oxford, UK, the poster on "CCINT: Cyber-Crime INTelligence Framework for Detecting Online Radical Content". Next, Dr. Jennifer Chayes, Technical Fellow and Managing Director at Microsoft presented the winner of Denice Denton Emerging Leader ABIE Award Winner Dr. Aysegul Gunduz. Dr. Gunduz develops tools and devices that identify neurology disorder. After that, Dr. Deborah Berebichez, Chief Data Scientist, Metis; Co-host, “Outrageous Acts of Science”, talked about her life story and how important it is to keep going and face all obstacles that may come in life, and how import it is to encourage each other. Next, Sherry Ryan, Vice President and Chief Information Security Officer, Juniper Networks, presented the winner of A. Richard Newton Educator ABIE Award Winner Dr. Marie desJardins, Professor of Computer Science and Electrical Engineering, University of Maryland. Dr. Marie desJardins has been detected to support women in computing. She has given them guidance, support, care, and feedback to female facility as they prepare for their tenure packages. The next speaker was Maureen Fan, CEO and Co-founder, Baobab Studios. Maureen talked about her nation in virtual reality and animation, and how it inspires you to dream. She also talked about storytelling and its strength to make you care about the character. She also talked about how to create your own path and follow your dreams even if it is not an easy path to take. Nora M. Denze Ended the Keynote by a quote by Grace Hopper herself, "Ships in the harbor are safe, but that’s not what ships are made for". During the Friday Night Celebration, we all went to dance, socialize, get swag from Google, eat food, and celebrate Grace Hopper. I met incredible people and had enjoyed my time. My recommendations for future attendees is to plan the talks you’re going to attend early on before the conference, and make sure you know where the talks are as people line up almost 15 minutes before the talk and spaces fill up fast. It is important to have a plan B talk. Also, some popular talks are repeated during the day, so if you could not attend the first session you can attend the repeat. In addition, do not miss the opportunity to socialize with other attendees or speakers. Also, if you are looking for a job or internship opportunity upload your CV to the GHC database, and have a print out of your CV for the career fair. Finally, you will receive a lot of swag during the conference, so prepare to make space in your bag. It was amazing to see all the women in computing, it made me feel I am not alone in this field. I would like to thank Grace Hopper for this amazing conference. I enjoyed every bit from meeting amazing women of computing to listening to the inspirational talks, dancing, enjoying Orlando, and seeing my sister who came all the way from Saudi Arabia.